Dr. Maximilian Schich is a professor of art and technology at the University of Texas at Dallas. His current research focuses on how the spread of the arts and sciences affected the spread of culture. To illustrate this process, he decided to map the movements of 100,000 of the most influential figures of western culture from the past 2,000 years. Among the names were people like Apple founder Steve Jobs, Pride and Prejudice author Jane Austen, and the famous artist and inventor Leonardo da Vinci. Earlier this week, I was watching an episode of the BBC series Human Planet and saw clips of some amazing, natural-looking root bridges in India. I immediately wanted to know more about them. 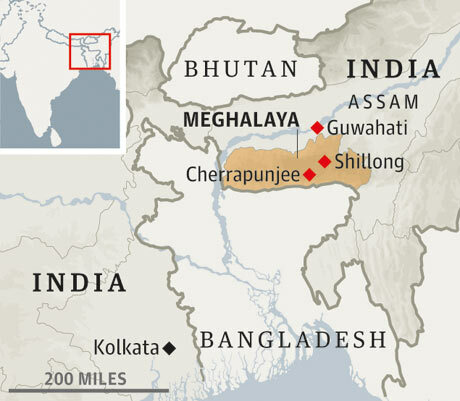 Cherrapunji is a subdivisional town in the East Khasi Hills district in the Indian state of Meghalaya. With over 75 feet of annual rainfall, the climate in this region is one of the wettest in the world. The intense rains have created a perpetually wet and often harsh environment. Local villagers are forced to cross numerous rivers, many of which can turn into violent rapids during the rainy season. But the wet climate has also given locals there a gift: it allows the Ficus elastica tree to thrive, giving the locals a solution to their problems. The construction of these structures is almost as remarkable as their beauty. Since their strength comes from the growth of the roots, the pieces of living architecture can take as long as 15 years to become usable. But after a bridge becomes functional it actually tends to become stronger with age- some of the older bridges can hold over 40 people at once. 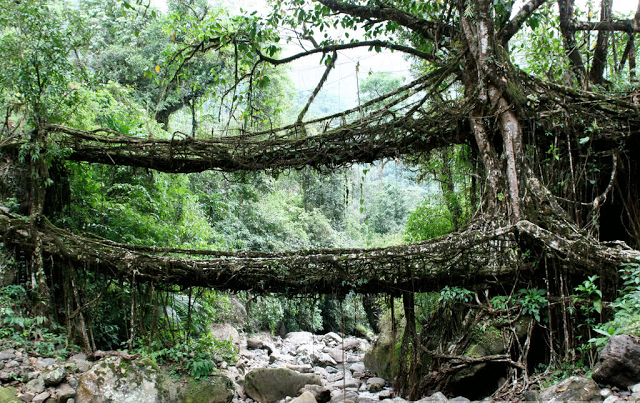 These bridges are still used daily by the people of the villages around Cherrapunji. Many people believe that some of the bridges are well over 500 years old. Over the decades, many of these bridges have grown deep foundations, and some have had rocks added to serve as foot steps. The most famous of these bridges is a double-decker bridge known as the “Umshiang Double-Decker Root Bridge”. This unique two-level root bridge is thought to be the only of its kind in the world. The search for extra-terrestrial life has been one NASA’s most important missions in recent years. NASA has estimated that in our galaxy alone, there are 100 million planets that cold possibly host alien life. Speaking at their Washington headquarters on Monday, NASA outlined new plans to use current telescope technology to help in the search. They also announced that they would be launching the Transiting Exoplanet Surveying Satellite in 2017 to aid in the search. said Matt Mountain, who serves as director at the Space Telescope Science Institute in Baltimore. The Institute will be launching the James Webb Space Telescope in 2018 to help in the search as well. Read the original story from CBS News here. Recently a man named Russ Schut was fishing in Sproat Lake, which is on Vancouver Island (Canada), just northeast of Washington state. 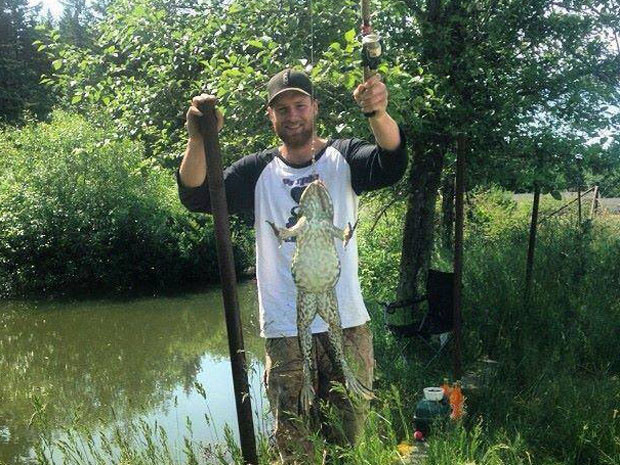 With just a worm as bait, Russ was able to haul in a 2-foot-long American bullfrog (which he released). Schut posted this picture with the enormous frog thinking that it wasn’t particularly exceptional, other than being impressively large. American Bullfrogs grow to an average length of around 7 inches and weigh up to 1.5 pounds, so the 2-foot-long Bullfrog caught by Russ Schut was defintly abnormal. A current study at the University of Victoria is mapping the rate of the bullfrogs’ spread. Wallin has theorized that they were initially introduced to the area by people emptying their aquariums, unaware of the environmental consequences. According to National Geographic, American bullfrogs can lay as many as 20,000 eggs, with tadpoles sometimes reaching lengths of 7 inches. These bullfrogs populate quickly and with few natural predators in the area they also populate effectively. Suitably, a group of bullfrogs is called an army, or colony. Though native to the American southwest, they now range throughout the continuous U.S., as far north as Canada and as far south as Mexico and Cuba. Their presence also has been documented in Europe, South America, and Asia. As of now there is no plan to rid the region of the American bullfrog. Check out some images of the American bullfrog below.